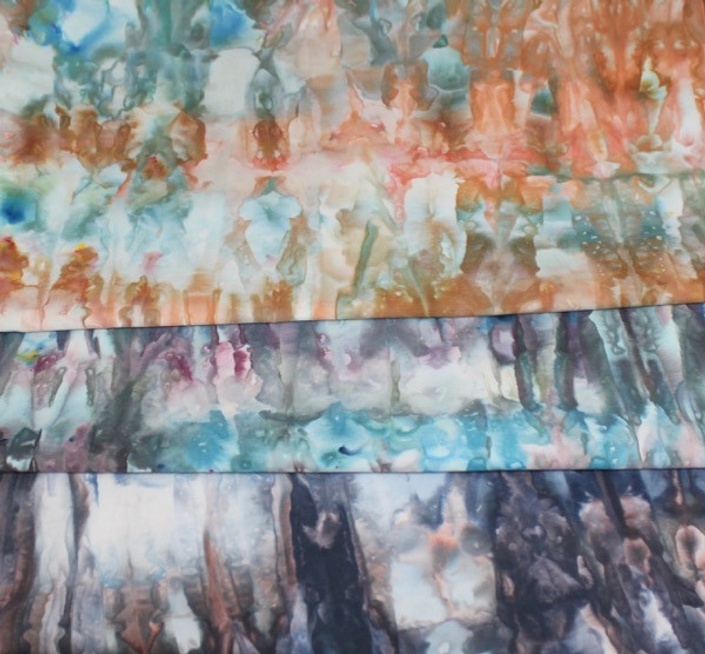 Would you like to produce those beautiful ice dyed fabric and clothing you see online? Are you ice dyeing your fabrics now and not getting the results you want? If you answered yes to any of those questions, my ice dyeing class is just what you need! You will learn 3 different ways to ice dye so you can choose the technique that gives you the results you want. You will learn dyeing safety precautions and the complete ice dyeing process including my dye calculator, to take the guesswork out of figuring out how much dye to use. I've included pictures of how the colors split of 45 different colors I've ice dyed. This list will save you from buying colors that may not give you the results you want. You will immediately be able combine pleasing colors with my favorite color combos list. But with the master list, you'll be able to create you own easily too. You will also learn which are the best dyes to control color splitting. You will receive detailed information about the supplies I use, and a supply checklist, making it easier for you to get started. To keep you organized, you'll receive a worksheet to keep notes on your dyeing sessions. Lastly, in the pattern section you will learn 11 different folding and clamping techniques to really show off your ice dyeing skills. Here is what students are saying about this class. "Although I have done quite extensive low immersion dyeing, as well as ice dyeing, I found your class well worth my time and money. Just seeing pictures of singular and combination dyes you used was really helpful. You encouraged me to try more ice dyeing with single dyes, and especially love the way Brazilnut and Oxblood Red broke out. I have since bought 9 colors you used that I did not already have just because of this, and have dyed using all, as well ice dyeing several. Thanks for your help, and thank you for taking the time and effort to produce your class!" "This class is well worth the price of admission... in fact it's a steal! Anyone who wants to be able to create gorgeous fabrics like this should take Lynda's class... I've been dyeing for a long time, but could never get good results ice dyeing until I signed up for it! " "Wow, Lynda, I’m sure glad I found you! As a long time sewer and applique quilter, the hardest part of any design was finding the right fabric…. but not any more. Your Icy Delights class took the quality of my projects to a new level that I never anticipated! I even sold one of my purses for $160!!!" "Your easy, down-to-earth teaching approach made this whole ice dyeing concept go from “How in the world can I do this” to “Easy-peasy!” And thank you for your ongoing and continued help and support, always available to answer my slew of questions, no matter how silly. Any other classes you may offer, count me in! I’ll be the first one to register!" Lynda, thank you for offering a most exceptional online class! Icy Delights encouraged me to explore ice dyeing in an organized, repeatable manor. I had only sprinkled dry dye over snow, resulting in so-so results and a few happy accidents. This class, with its easy to understand, step-by-step study of how colors split under with each of three techniques was just fascinating and resulted in intricate, rich pieces. Then, by combining dye colors, I was able to achieve some really beautiful pieces. Your examples and clear instructions made this easy and fun! The fabric folding and manipulation demos were very helpful. I feel Ike a fiber artist for the first time and I've been quilting for 40 years! I also love being part of the Icy Delights Facebook group...the learning and sharing go on!! Thank you again for your dedication! I would certainly recommend this class to increase or add to dying confidence and enjoyment! "Caution: if you love to play with colors, you will have so much fun with this hobby that you will want This Color and That Color, and "Wow! Look at that color split!" and "Oooh! another pretty color I haven't tried!" Lynda's class will tell you everything you need to know to get started, and the Facebook group is a great place to share and learn." I created the popular dyeing technique called ice dyeing, writing the first article on ice dyeing, which appeared in Quilting Arts August/September 2011 issue, and taught a webinar in June 2013 on that topic. I have continued ice dyeing, working on resolving problems I've been asked via my website. In addition to playing with ice and dye, I also love working with other ways to change the look of the fabric’s surface including, but not limited to, sun printing, soy wax batik, discharge, gelatin printing, thermofax screen-printing with dye attractant and inks, and marbling. I also love using all kinds of tools for marking the fabric from potato mashers and wood printing blocks to doilies and lace. Is there anywhere to share my dyeing with other students? Yes! This course comes with a private Facebook group. You will be sent an email after you register how to access that group. Who can I contact with more questions about this class?